When we bought our current washing machine we were very short of cash. We’d not long moved house and I wasn’t really earning anything to speak of from my online freelance writing work. We couldn’t really manage without one for long (even with my parents along the same street). So what to do? We eventually worked out that we had points on our credit card, which could be swapped for vouchers for a particular store. I scoured the site trying to find the best value machine possible. I found something that ticked the boxes and we bought it with the vouchers and paid the rest in cash. Frankly though, it’s been a disappointment. We bought a brand we’d never heard of and I’m guessing there was a reason why. The machine is noisy and the spin isn’t very efficient. Sometimes the washing is still dripping wet and I have to respin it. The timer clock that I was looking forward to (our last machine didn’t have one) is a work of fiction. The main cycle I use claims to last an hour when you put it on, but it takes 1 hour and 20 minutes. It doesn’t have a 30 degrees programme either, it’s either 20 or 40 degrees and nothing in between. The annoying thing is that if we were replacing it now, whilst we would still want a good value machine, we could afford to invest in a better brand. We’d like a brand with a reputation for reliability, one that we can trust. Paying a little more for that peace of mind wouldn’t be such a problem and we’d like to be able to pick and choose a few features like bigger capacity and lower noise. I’ve been window shopping a little, seeing what is out there and what we might buy if a) our machine dies b) I persuade the other half that the current washer is just too annoying to continue with. 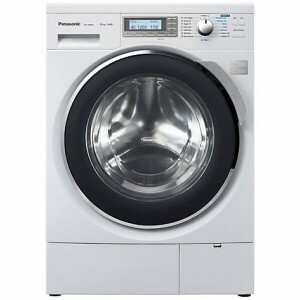 I’ve been quite taken with Panasonic washing machines, they seem to be good value. Wish me luck with persuading the husband!